My dad struggles with keeping his balance when navigating his way around the house and is reluctant to go anywhere in public for the fear of falling. After doing some research I figured out that walking frame with wheels (also called a Rollator) would be perfect to use in and out of the house to help him keep his balance. A rollator is much more suited to aid with walking in and out of the house as the frame has wheels and does not need to be lifted when walking (like a traditional zimmer frame). A Rollator also has brakes to give the user maximum control when using the walker. Here is a round up of the best for Rollators that I found when researching to buy one. I have put all of my findings into one post to save you the time of researching! At the bottom I share which Rollator I bought for my dad and how he got on with it. What stands out about this rollator? This is really well priced and robust rollator. The frame is fairly large, which gives a greater stability. As with most rotators, the seat is padded and contains and hidden storage compartment underneath. I really like the back support bar on this walker, it is situated in a way that when you sit down on the walker, you can’t accidentally sit back too far and become unbalanced and fall over. The back bar also provides some support for the back if the person sits for a long time, (perhaps whilst waiting for a bus for example. The handles are designed in a special way so that they are easy enough for even an elderly person with arthritis to operate. This R8 model is suitable for indoor and outdoor use, whereas the slightly cheaper R6 is only suitable for indoor use. The aluminium frame makes this rollator robust yet lightweight and also aniti rust. The handles on this rollator operate a brake for walking and also a parking brake so that you can park and sit down on the seat comfortably without worrying about the rollator moving. The DeVilbiss rollator folds up neatly and easily. It would be really easy to store in the entrance hallway or under the stairs. This rollator is great for someone who is capable of walking at a fairly quick pace, the three wheels off more support and stability than a four wheel walker. The handles of this rollator are designed to be very easy to use, even for someone with arthritis. Although the Days rollator doesn’t have a seat to rest on, the braking mechanism still has a parking brake which is good for when the person wants to take a little rest of to look in their bag. The bag is also much larger and deeper than most rollator storage facilities (which are usually small compartments under the seat unit.) This makes this rollator ideal for grocery shopping. The handle height of this trike walker can be adjusted from 83cm to 93cm and it is really quick and easy to adjust the heigh of the handle-grips. This makes it an ideal trike walker for a couple to use, if one person is taller than the other, the walker can be adjusted in no time. 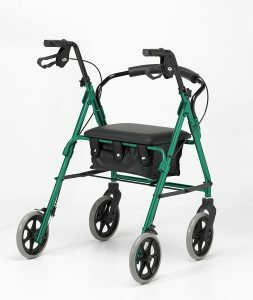 This walker is available in blue, ruby red, purple, grey black or orange, which is a really nice touch. Especially if the person that it is for it reluctant to use a rollator at first, if it is in their favourite colour, they may be less reluctant to using it straight away. The fact that this rollator has three wheels makes it much easier to store than a regular four wheeled one. (Without having to fold it down.) the triangular structures means that when not in use, the rollator will fit neatly into a corner to avoid it being a tripping hazard. This three wheeled rollator is also very light, at only 5kg, it is easy to manoeuvre and to fold to put away. I really do like this rollator, and if it hadn’t of been for the fact that Dad was able to walk more naturally with a three wheeled rollator, then we would have bought this one. I think the clip on tray feature is just brilliant, this would be so helpful for someone who struggles with their balance. Something as simple as carrying their dinner to the living room or to the dinner table can prove to be a huge challenge, by placing their dinner onto this tray and wheeling it in, they can stay safe and avoid frustrating accidents and spillages of the food or drink onto the carpet. The front two wheels swivel for easy manoeuvring and navigating. Under the clip on tray is a seat which can be easily used to rest on when out and about. The braking mechanism allows you to park the rollator to safely sit down without any movement. Something that I really appealed to me with this rollator is the fact is has a walking stick holder. If the person walks with a cane or walking stick, they can attach the can to the rollator and keep moving, this makes it much easier for them to stay balanced and reduces the risk or a fall. This rollator is easy to fold and the handles can be removed quickly and easily to make it small when folded. It is ideal for small homes and bungalows, with the handles removed this rollator is only 20cm deep, so it could be stored in the hallway or under the stairs for example. I love the colour choices of this rollator, such a small detail, but the personalisation of the colour of the frame makes the rollator less of a generic item and more suited to the person. The Days 09 rollator is quite similar to the DeVilbiss rollator; it has a back rest, a seat with storage underneath, ergonomic handles and good brakes for maximum control, along with a parking break for resting. The front two wheels are swivel wheels which make it easy to navigate. The wheels of this rollator are solid wheels, so there is no chance of them deflating or getting a puncture. I like the seat rest on this rollator as it is larger than many of the other ones; at 35cm wide, it provide a more comfortable and supportive sit down. The Days rollator comes with a travel bag as standard for easy transportation. The other thing that I really liked about this mobility walker is that it can be ordered in different sizes. Many walkers are a set sized frame and are too big and cumbersome for a petite framed elderly person or a frail person. This rollator is available in extra small, small, medium or large. This also applies if the person is very tall or of a larger build, a rollator frame that is too small could be dangerous for them to use as it wouldn’t provide adequate support or stability for their strength. The price is reflected in the size of the rollator, so measure the desired handle height and seat width first of the person to determine which size to buy. At only 9.kg, this rollator is pretty easy to manage and to store. The folding mechanism is operated by simply lifting at the seat. The whole framework then folds up and can be stored or transported easily. This Elite Care rollator certainly does stand out from other, it look very unique.. but why is this? The X Cruise is the perfect rollator if you like to travel. It is the smallest folding rotator and fits into a travel bag that would easily fit into a car boot and could even be taken on a plane to put in the overhead luggage compartment. The reason that this rollator looks different from others is its unique ability to fold easily and into a tight bundle. Like all other rollators, the X Cruise has very good brakes and a parking brake for sitting down to rest. There is a large bag at the front of the frame, which is convenient, but isn’t really in the best location for easy access. The handle adjustment is very quick and easy, even for someone with frail hands to operate. This is the only rollator to ave features something called a ‘Stepper Tube’; this is a level that can be pressed by the foot to help to tilt the rollator backwards in a controlled manner. This is supposed to help people with getting up curbs and small steps without losing control and having to tilt the rollator by upper body strength alone. Its doesn’t seem like the most necessary feature, but something worth mentioning and explaining. The handles on this rollator are more like generic brake handles on a bike and less bulky – this means that whilst they might not be as suitable for someone with arthritic wrists or hands, they might be preferable to someone who has good use of there fingers and wrists and these handles feel more like bicycle handlebars than mobility aid handles. This rollator folds up to be the smallest one I have seen – the price is very reasonable, considering its unique design features. The bag is not included but could be bought for very little money. It is worth mentioning that to get this rollator folded down to the size you see below in the image, you need to unscrew one screw completely. This is not a design flaw, just something worth mentioning, removing the screw is also very easy, as it has an ergonomically designed screw head which can easily be turned by hand. Which rollator did I buy for my elderly father? After researching all of the different brand and features of all the rollators available to me, I decided to buy the Days Three Wheeled Rollator. The purpose it was built for was more for assisting him getting around the house, more so than walking outside. He tried out a four wheel walker and a three wheel walker and found the three wheel walker to provide more stability and comfort when walking. As the walker was for using in the house, he didn’t really need a seat to sit on to rest. This is the only downside to a three wheel rollator, lack of a seat. If you are thinking of buying a rollator for getting around town, you may benefit more from a four wheeled rollator with a seat built in. Another factor in choosing the three wheeled rollator was the ease of storage. My parents aren’t really capable of folding up a wheeled walker in between of uses, they needed it set up permanently for easy access around the house. This is where the trike walker came in handy. If the want to put the rollator out of the way, they simply park it in a corner so that it is not a tripping hazard. In fact, my parents were so please with the three wheeled walked that they actually asked me to order another one to keep upstairs. This way, they have one up and downstairs so they are never without a walker for getting around safely.